There's been a healthy debate of late about whether mobile apps are a long term business or whether web apps running on mobile devices will ultimately win out. It's an important debate to have and while I favor mobile web apps, the current state of mobile technology and connectivity certainly favors the mobile app in the short term. But lost in all of this debate is the least common denominator – sms (or texting as it is know in the mainstream). I believe that Twitter's native implementation of sms is an important part of its success. The 140 character limit was driven by the 160 character limit of sms and the initial design of the service put sms compatibility up there near or at the top of the system requirements. Other competitive services, including Facebook, are just not as natively available via sms the way Twitter is. Of course most people access Twitter and Facebook and other web services via mobile web interfaces and apps. I don't know the current percentages but I think something less than 15 percent of Twitter updates are posted via sms. And the number of people following via sms is also relatively low. But I think it is critical, particularly early on in the commercialization of a mobile web service, for there to be an easy and quick sms interface. It allows potential users to see the value of the service without having to download anything. And it is always faster to shoot out a text message than load a mobile app or a mobile web page. And the onboarding experience can also be easier via sms. Jack Dorsey, who built the first version of Twitter, showed me the easiest way to sign someone up for Twitter a few years ago. He said 'when you want to get a friend on Twitter just tell them to send "follow fredwilson" to 40404'. For those of you who don't know, 40404 is the Twitter shortcode in the US. I've used Jack's approach dozens of times since then. I've been playing Foursquare lately and I blogged about it last week. I check in most of the time via sms. Many people who play foursquare don't know you can do that. It's fast and easy. Much faster than loading the iPhone app and checking in. I don't know if you can sign up for Foursquare via sms (like you can with Twitter) but it would be great to be able to do that. Let's say you are at dinner with friends, you sit down and do a Foursquare check in via sms. Your friends might ask you what you are doing. And you show them and they then do the same thing. That's virality and friends showing friends is one of the best ways to get mobile web apps to spread. So while its true that serious mobile web services require mobile apps and good mobile web interfaces to deliver real engagement, it is also true that you should offer a simple, easy, and fast sms interface. Its the least common denominator, its on every cell phone out there, and it will help you build your user base. I'm in europe this week doing a bit of work amidst a mostly famly vacation. I'll be in Paris, Stockholm, and Slovenia this week. As much as I'd like to meetup with entrepreneurs on this trip, my opportunities to do so are limited. I'll be posting some photos on my tumblog and may post a bit about stockholm and slovenia on this blog. James Altucher penned a column in today's WSJ titled The Internet Is Dead (As An Investment). James is a fund manager and well read columnist on investing and he is entitled to his opinion. He puts his money where his mouth is. But so do I and since we continue to invest heavily in the Internet, I thought I'd take the opposite side of this debate. We (my partners and I at Union Square Ventures) think the Internet is one of those transformative technologies that changes everything. We see it like the industrial revolution or the invention of the printing press. It is a huge game changer. The Internet has been a commercial technology for about fifteen years now. And we are beginning to see the impact of it on everything around us. The industrial revolution and the Renaissance before it lasted a century or more. It takes a long time for such fundamental changes to work their way through the system and produce a new "normal". Periods of great change produce fantastic investment opportunities and also destroy stable predictable businesses. Investors have the choice to take a chance on the new opportunities, stick with the stable predictable businesses, or sit on the sidelines. I prefer to do the former. Nobody can figure out a business model. there, AOL. And News Corp. is shaking up its MySpace business as it figures out its next steps. (News Corp. owns Dow Jones, publisher of this newswire.) Microsoft has spent billions on Internet strategy without a dime of profit. These are the "stable predictable businesses" that might be destroyed by the changing dynamic. I am not saying they will be. But they could be. The fact that Time Warner is selling AOL and holding on to magazines doesn't convince me that it is going to be a long term survivor. AOL itself is a business that has been negatively impacted by the Internet. AOL was never a pure Internet business. It was a dial-up access business connected to a proprietary online service. I'll leave Twitter out of this because it is too close for comfort. But Google can easily monetize its huge and growing apps business (which is a huge threat to Microsoft) and also its local franchise. Who doesn't use Google Maps these days? And Facebook is going to produce $550mm in revenues this year, is EBITDA profitable, and has a self serve ad system that is growing like weeds and giving local advertisers the best local targeting around right now. And what about Amazon, eBay, and Craigslist? And international businesses like Baidu, Lastminute, Vente-Privee, Tencent, and Sohu? There are easily a dozen and probably two dozen worldwide Internet businesses that investors should own today and for the long haul. I expect that number will grow over the next couple decades to include hundreds of large global Internet businesses that investors can own and make money with. Yes, barriers to entry on the Internet are low and there are no regulated monopolies that James likes to own. But network effects, data leverage, and scale are huge economic advantages online and if you look for businesses that have them, you can and will make a lot of money as the Internet revolution changes business, society, and the world around us. I think you have no other choice other than keeping your money under your mattress. Jason Kinkaid has an interesting post on Techcrunch today about the summer TV doldrums and the opportunity this time of year presents for catching up on earlier seasons of shows you like. I like to watch what my kids do, particularly as it relates to entertainment, as it gives me a clue about where things are going. And my kids are doing exactly what Jason suggests. They are catching up on prior seasons of Friday Night Lights, The Office, and Weeds. This is not new behavior for them. They've been using the off season to do this for a few years and they used to purchase the older seasons on iTunes and watch them on their laptops. That would drive me crazy because often one or two or all three kids would purchase the exact same season of shows on their respective computers. I would push them to share their purchased shows and often they would do that, but not always. 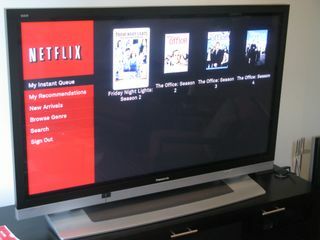 So I am happy to report that they've moved on from iTunes and are now watching these older seasons on Netflix Watch Instantly, both via the browser and on Boxee (the photo above is Netflix on Boxee in our family room). The other interesting development is they are moving away from watching these older seasons on their laptops. They still do that quite a bit, but I've noticed that more and more they are opting to watch on the Mac Minis we've got connected to big screen TVs in our home. When they have friends over, it used to be the set top box was the device they'd watch TV on the most. Now its the Mac Mini. Last week, some on Wall Street got all crazy about a research report written by a 15 year old intern at Morgan Stanley. I read the research report as it was sent to me by about a half dozen friends who work on Wall Street and indeed it had some interesting insights in it. But not all 15 year olds are alike. Just as it is dangerous to read too much into what my kids do, it is dangerous to read too much into what a 15 year old in London does. But it is absolutely critical to pay attention to what teens all over the world, particularly the developed world, are doing. And one thing they are doing is changing their media consumption habits quickly. My kids have moved from the set top box to iTunes to Netflix in less than a couple years and are now watching much of their TV streamed over the Internet. I expect they are not alone. It's a trend worth watching. Our portfolio company Meetup has big potential for its API and platform and is looking for a super strong engineer to lead its efforts in this area. Meetup is located in NYC and is a strong, well funded leader in its category. Knows Java and Python inside out. Has worked extensively with relational DB's. Is comfortable "getting the word out" and evangelizing the API. Is comfortable supporting a developer community. Understands the architecture of the web and how it pertains to public API's. Understands modern identity and authentication standards (OpenID, oAuth, etc.). If you are this person or you know somebody who fits this description, please send an email to [email protected]. Last week I wrote a post saying that I view the exclusive contracts that carriers negotiate with handset manufacturers as anti-competitive. I really don't want to see the government wade into this market if there is another way to unwind this practice. I just saw the news that Verizon is offering to cut is exclusive contracts to six months. This is clearly in response to the threat of government regulation and I hope that voluntary changes in the market like this will get us where we need to go. The bottom line for me is we should work toward a market where any device can operate with any phone number on any network. That is the architecture that has made the internet such an unbelievable platform for innovation. The mobile market, if set up properly, may have even greater potential for innovation. The only thing that is currently holding it back is that the business and technical architecture of mobile is based on closed systems and exclusive contracts. It feels like we are moving, slowly but surely, in the right direction. That's good to know as a user of mobile devices and as an investor in the mobile web. There was an interesting debate in the comments to my post yesterday on active and non-active users. I agree 100%. If I could get 10% of my inactive www.alacrastore.com users to be active the business would be significantly better. Now, these are two entrepreneurs who I backed over 10 years ago who have both built profitable and valuable businesses. So they know a thing or two about business. But I think they are both missing an important insight. When I think of online retailing, I think of three kinds of users; non-active users, active users, and active users/transactors. As Gian points out, for a business to succeed, it needs to have a healthy number of transactors. But looking at your user base as either non-active or transactors is the wrong way to think online (and maybe offline too). Just like bookstores use cafes to bring potential purchasers in the store, online retailers should intentionally cultivate an active non-transactor user base. Our portfolio company Etsy does a good job of this. Many of the visits to Etsy are to read The Storque, participate in the conversations in the forums, or to build up lists of your favorite things. There are literally millions of people who do these things every month. Some of them choose to transact during these visits, but many do not. So I'd advise all online retailers to focus on making users active first and foremost and give them a lot of things they can do on your website beside transact. By doing that you increase the number of monthly visits and therefore the total amount of potential transactors. Yesterday I attended the Betaworks Brown Bag lunch and got to see Scott Heiferman (founder/CEO of our portfolio company Meetup) talk about the State Department sponsored trip to Iraq he participated in earlier this year. During the discussion that followed, I went off track and asked Scott to talk about SMUGs. SMUGs are "successful Meetup groups". They are the groups that meet regularly and are highly active in the service. Meetup determined a while back that SMUGs are the most important metric for their business and they track SMUGs carefully and constantly. Every web service has a core group of active users and a much larger group of total users. People talk about the "twitter quitter" syndrome where only 40% of all users are active. I am not going to comment specifically on that 40% number other than to say that it did not come from Twitter and I am not sure it is accurate. However, it is absolutely true that not all registered users of Twitter, Facebook, Meetup, or any other social web service are active. I've had a Facebook account for at least four years. I've only been active on the service recently since I started using it as my social net for friends and family. For all the time prior to that, I was counted as a registered user, but I was not actively using the service. It is not a problem for a service to have a large group of non-active users if they have a large group of active users. It's the latter group that you need to focus on. Over time, I've learned that many non-active users become active for one reason or another. But they don't become active by focusing on them. They become active because you focus on the successful users and make them even more successful. Your best advocates are always your most active users. So focus on them, make them successful in your service, focus on growing that number, and the non-active problem will take care of itself. Though I am late to this game, I have started playing foursquare. I tried to get into it a few times, but since I don't carry an iPhone, the web UI always turned me off. But Eric showed me the mobile web UI a few days ago and that works well for me. For those who don't know, Foursquare is a game about "checking into" places you are physically at. The game play is light but fun nonetheless. You get points and badges as you check into more places. I'm a big believer in the power of game play to encourage users to engage more frequently with a service. The other night, I realized that I was about to go to a place that Mike Galpert had been to about an hour or so before me, so I called him to ask what he had. Indeed, the spinach gnocci at Supper was excellent. Foursquare is delicious for places. It's a dead simple way to record where you've been, and if you feel like it, what you thought of it. I like that idea and that's why I am going to play foursquare. I am also very encouraged by the fact that, like Twitter, Foursquare has an API that allows any developer to build a Foursquare app. I hereby request a slick Blackberry app. What I'd really like is a mobile app that would allow me to check into foursquare and also check in with Twitter. I'd be all set then. This is my profile. I'm just getting started. I am going to use the Facebook rule in terms of friends. I am only going to friend people I actually know and would likely go out to dinner with. So if you request me and I don't accept, please don't get upset. Yesterday morning I was talking to my 13 year old son Josh. He's currently obsessed with the TV show Friday Night Lights. He's going back and watching all the old seasons. I asked him how he is doing that, expecting to hear "bit torrent". But instead he said "Netflix Watch Instantly". I was so happy to hear that and asked him why. He said, "bit torrent takes too long." And then this morning, I came across this story in The Guardian which talks about a collapse in illegal sharing and a commensurate increase in legal streaming. The story says 26% of 14 to 18 year olds shared music illegally last month compared to 42% in December of 2007. The story also says 65% of teens stream music regularly. I am not a fan of file-based media business models. They lead to piracy and they put transactional friction into a system that doesn't require it. Streaming is much better. Unfortunately, we don't have a good mobile broadband system to make streaming possible everywhere. And until that happens, we will have files and we will have piracy. But the good news is that as the media business wakes up and puts all the media we want out there in streams available on the Internet (paid or free – this is not about free), we see people streaming more and stealing less. We used to wonder if we could "untrain" a generation to steal. The answer is yes. Just make it easier to get the content they want and they'll stop stealing. It makes my day to read that.